October 16th, 2005 TBI and how we survived it. I kept a journal when Terry got hurt, these are entries from that journal and those times. I hope they can help someone else struggling down the same lonely road. We brought Terry home from the rehab center yesterday. Its only been 32 days since the Deer Incident. It is amazing how far he’s come and daunting how far he still has to go. 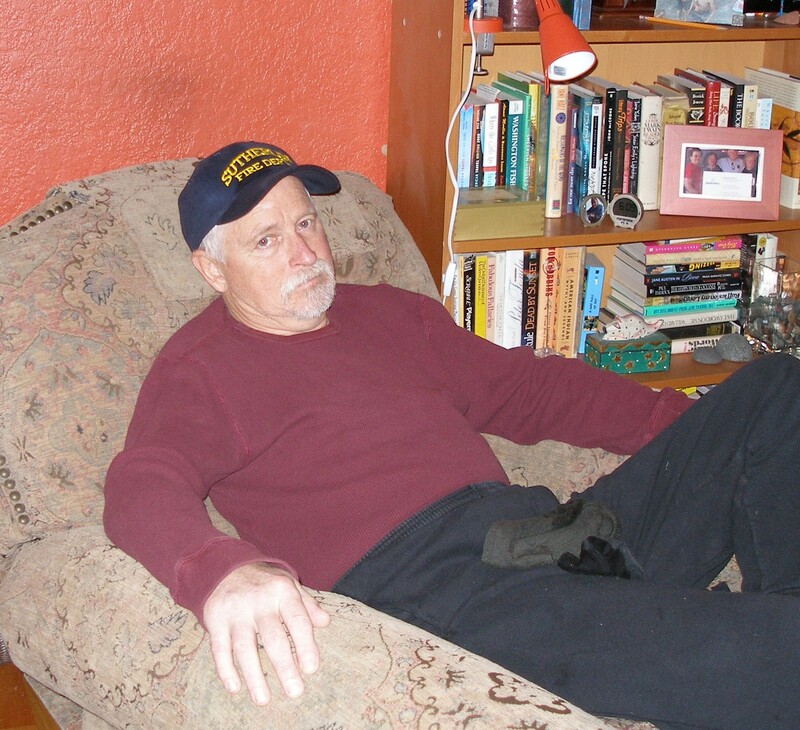 Thank you Darrell Allston for being such a friend and helping drag all the contents of Terry’s room at the rehab center room home–how did we acquire that much crap in such a short time? accent. If you remember those you are showing your age–or mine. and wonders how we can afford it. I had ten prescriptions to fill on a Sunday, that was fun–and to keep them straight I made up a little chart so I could tell when to give him what. He’s alive and doing better so I really don’t want to kill him by giving him the wrong meds after all this. Terry showed up fresh from a rest in his chair in the living room. He got a spoon and wanted to taste. Visions of steam burns etc., ran through my head as I sprinted from the bathroom with my plaster covered paws from the shower renovation. being gone he will wolf down anything in sight including hot raw rice. decided he HAD to get outside. I grabbed his house shoes and sprinted after him with the ring of keys to the garage. He demanded the keys, I demanded he put his shoes on and he wasn’t having any of it–emergency averted when I reached around him and unlocked the garage. He put on his house shoes like there had been no discussion and went into the garage. The bike was there and he said it looked like it needed some work. He started folding stuff up and putting it away but got distracted and went wandering back out and into the house. His attention span is about 2 -5 minutes. This is discouraging but it is getting better by inches. 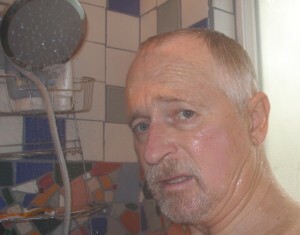 terry tests out the new shower. These pictures don't even look like Terry. Eerie, how a face can change with the mind of the person inside. He has been far more peaceful at home although he still cannot tell me he is in Olympia–when I ask where we are I get between the kitchen and dining room–or something like. Last night he was tired and crabby and about half asleep from 5 pm on. He demanded we turn the teevee OFF and it was turned down very low. This was at 8:30 p.m. I am tiling the shower and trying really hard to get it done but what a job–I’m sure the sound of breaking tile didn’t help much, but I told him I had to do it and that was that. It is hard to find the balance between his life and Torin and I having a quality of life that is acceptable. I am looking forward to the professionals assessing him this week so we can get some caregivers in while I have one nerve left intact. In home rehab starts tomorrow too and that should be helpful. I want to learn what they do so I can keep stimulating his brain. We have pretty much isolated the source of 70% of his pain as his right shoulder. I don’t think it got much attention in the fray and is now surfacing as a source of agonizing muscle spasms. I’m guessing he’s torn some stuff in there and hopefully we can get his doctor to take a look at it this week. Terry and Nellie. She has never been allowed up on the bed before. Very odd. of fear when you are having a perfectly lucid conversation with him—except that he won’t remember in five minutes in most cases. I keep telling him things will get better but mostly I think I’m telling me. I’m sure they will too, but no one has a written a road map for this peculiar territory and it’s easy to get lost. 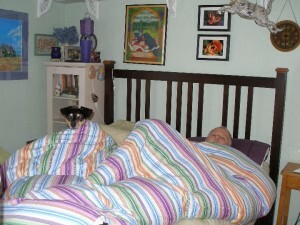 I can tell things are different–the DOG is on the BED and he invited her up. Whoa….. Toto we are not in Kansas anymore because in Kansas the dog is not allowed on the bed so you’d better enjoy Oz before Terry finds his ruby slippers and clicks the heels together and you get booted back to the dog bed. This entry was posted in Down the Rabbit Hole:TBI and tagged Traumatic brain injury, traumatic brain injury and families on October 27, 2011 by rox. as i continue to hold you and Terry in my heart ~ know that i’m here to remind you that IT WILL GET BETTER.